If you’re looking for RFID protector, this is a really good deal! My husband bought a RFID blocking wallet a few weeks ago and it’s already broken. The RFID Blocking Passport/Sleeve Combo Packs are a smarter way to go. All you have to do is place your credit card or passport inside the sleeve and then place those items in your existing wallet or purse. I was very happy to see that this pack comes with two passport size sleeves and eight credit card sleeves. The credit cards sleeves have for vertical holders and 4 horizontal holders. Very cleverly designed! One item to note is that in pictures the sleeves look like they are made out of clothe, but they are actually paper. The 2 RFID Blocking Passport Sleeve Combo Pack by BLOCKIT lists for $29.99, is currently on sale for $9.99, and has a 90 Day Money Back Guarantee. 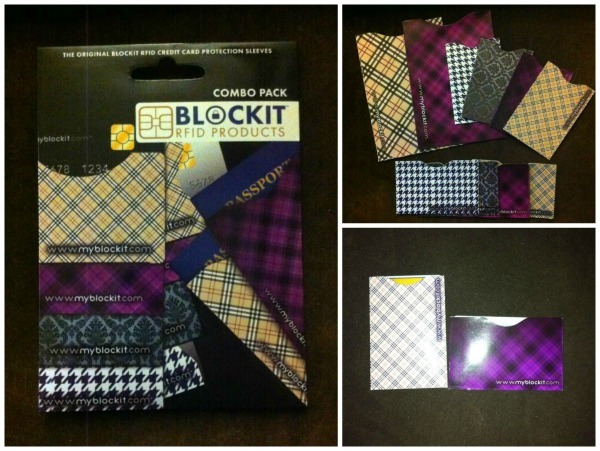 You can find this product by BLOCKIT on Amazon.